Crypto futures are contracts that you enter into with another market participant. These contracts allow you to put up a fraction of the price of the instrument that you want to buy or sell. Having this ability is called LEVERAGE and the amount of money that you need to put up is called margin. For example if you only need to put up 1/10th of the instrument price that is 10X leverage, if you can put up 1/50th of the price that is 50X leverage and so on. Once in the trade the future contract will move dollar for dollar with the underlying instrument. So you basically win or lose money as if you were trading the actual coin. Let’s look at a basic example. Let’s assume that Bitcoin is trading at $4,000 and you think it will go up. With 10X leverage you will only need to put up $400 in order to enter your trade. Your trade will be to buy the future contract. If you are correct and the price of Bitcoin moves $100 in your favor to $4100 you will make $100 on your initial $400 investment. $100 profit divided by $400 investment is a 25% return! If you did not use a future contract you would only get a return of 2.5%. 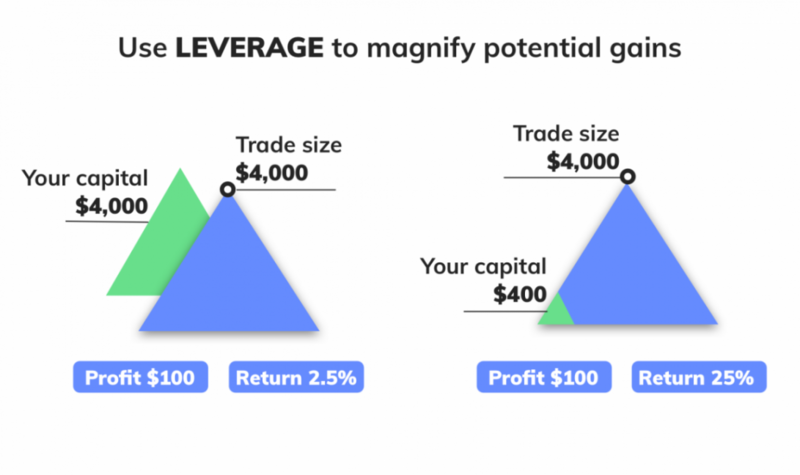 By using a 10X leverage futures contract you are able to magnify your return by 10 times. Futures contracts are available on many instruments. There are futures on stock indexes, grains, cattle, oil, gold currencies and more. It is only fitting that there are futures contracts on crypto currencies. In this section we will address certain unique characteristics of perpetual crypto futures also known as perpetual crypto swaps. This will show you how to better use it for your benefit. Leveraged – Just like traditional futures contracts crypto futures are leveraged. As discussed previously this allows you to put up only a fraction of the price of the instrument that you want to speculate on in order to enter your trade. Leverage is an integral part of futures trading. As you know there is a high risk of hacking and digital theft in the crypto space. Leverage allows you to put up less money with your broker and thus minimizes your chances of you losing it to online criminals. 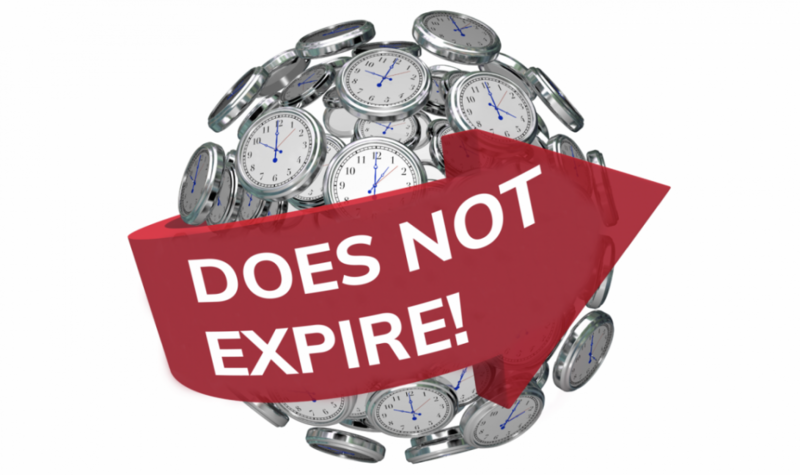 Non-Expiring – Traditional futures contracts typically have an expiry date. At this date the bet basically must be settled between the buyer and the seller. Unlike traditional futures perpetual crypto futures never expire. Instead they are traded in and out of by market participants. If you enter into a perpetual crypto futures contract you can exit any time you want with profit or loss. Liquidation – If you get into a perpetual crypto futures position you need to put up Margin. Margin is basically the x% of the price of the coin you want to trade. For example if you have 10X leverage and BTC is $4000 you will need to put up $400 to enter into your trade and to stay in it. If the balance in your account drops below $400 your position will be automatically closed by your platform. This is just a basic example of what liquidation is and how it works. Specific liquidation rules vary from platform to platform and instrument to instrument. Traded online – Perpetual crypto futures are traded over the internet in online platforms that match up buyers and sellers. Trade long and short – Perpetual crypto futures allow you to bet on the price of Bitcoin going up as well as the price of Bitcoin going down. If you think that bitcoin is going to go up in value you can buy a futures contract and if you think the price will go down you sell the futures contract. This benefit is hard to achieve with traditional deliverable crypto exchanges. Because if you think the price of a certain coin will go down and you are not holding it, how can you sell it? Never lose more than you put in – With some traditional futures you can lose more than you put it and actually owe your broker money. 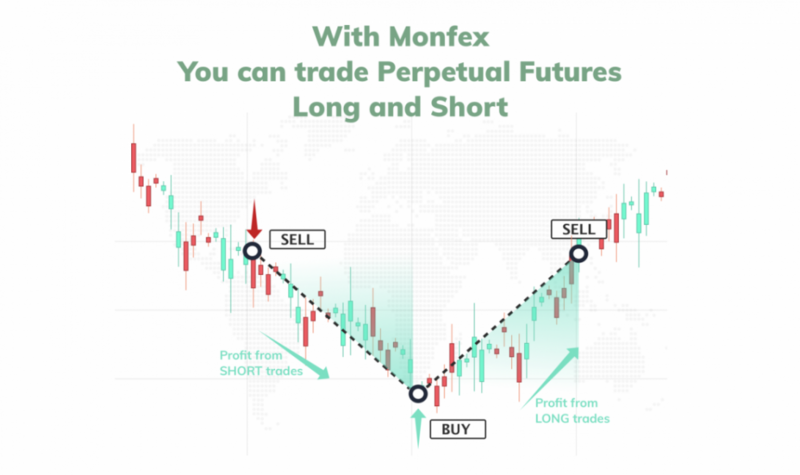 With Monfex perpetual crypto contracts you can never lose more than you put into your account. For example if you have $1000 in your account and the trade moves against you fast by $2000 your loss will be capped at $1000 which is your account balance. To sum it up, perpetual crypto futures are also known as perpetual crypto swaps. 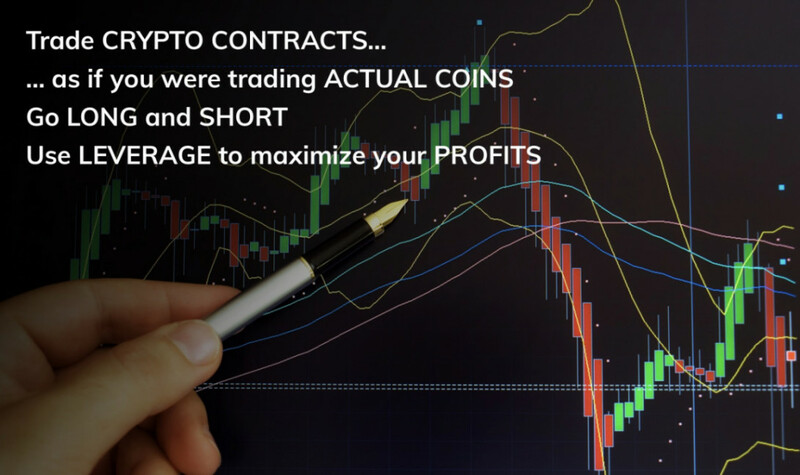 They are contracts that allow you to speculate on the price movements of crypto currencies by only putting up a fraction of the price of the digital coin that you want to trade. Unlike traditional futures perpetual crypto contracts never expire. They are traded electronically online. And they allow traders to bet on upward and downward movements of digital coins.